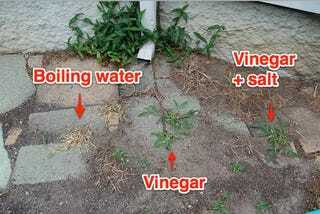 DIY Weed killer Solutions Without The Use of Chemicals! Do you love your garden but find the weeds seem to take over and grow faster than the plants? Does the thought of the dangerous chemicals that are present in the mass produced weedkillers put you off even attempting to kill the weeds? Well, this article is all about looking at the safer DIY weed killer alternatives that you can easily make. This first one is self-explanatory and well worth a try. I would imagine you will have to use a bit of trial and error. The next article has been very well researched. You will find the results interesting! This is what the first area looked like right after spraying one side with vinegar and pouring boiling water on the other. You can see how fast the boiling water worked. The weeds started to turn brown right away. The vinegar-sprayed side, however, showed no change (not that I expected any that fast). Two days later, the area sprayed with vinegar did die off a little, but not as much as the boiling water part. I had read somewhere that adding salt to vinegar would increase the solution’s weed-killing powers, but that actually wasn’t the case here. That side seemed to grow even more weedier. 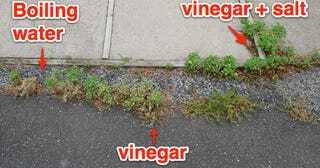 Moral of this story: Do not feed your weeds vinegar and salt! Area two shows the same results: Boiling water killed the weeds, but the vinegar was a bust. Today, a few weeks later, the areas treated with boiling water still have no weeds growing, thankfully. Wow, who knew, boiling water! That certainly is a great alternative for the pesky weeds that grow on our driveways. Another tip I discovered was the use of baking soda, apparently this neutralizes the ph of the soil so prevents weeds from growing. Finally, apparently the use of cornflour will stop seeds from germinating as you will see in final featured article. If you really want to try the safer alternatives then you can’t go far wrong with the advice featured above. We all know the dangers that chemicals pose to our health, the health of our children and our pets. If you have your own solutions and tips on how to make your own DIY weed killer, then we would all love to see. Please share on our facebook page or in the comments below.